Pokemon Go Natures can determine which stats your Pokemon will excel in and how it’s personality is. Originally introduced in Generation 3, Pokemon Natures can negatively and positively effect your pok. Here i’ve provided some very handy examples on what to look for and look out for. It’s common that you try to find that can decrease your Stamina/HP if your pok is primarily an Attack based. For example, Dragonite or Exeggutor. These types are very strong overall but they both have among the highest base attack in the game. Always use your pokemon go natures to your strengths and not your weaknesses. 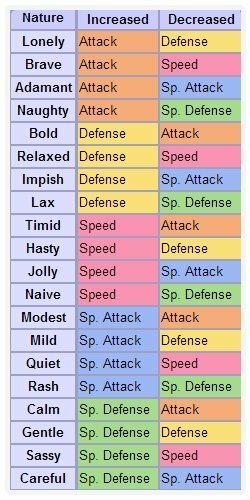 Pokemon Characteristics In Gen 3 you fed your pokemon berries to raise or lower your stats based on it. Similar to Jazz Berry for making poks much easier to catch. We may see other berry’s increasing stats like max cp, hp, attack and defense. These will soon be introduced which will include the flavors of spicy, sour, sweet, dry and bitter. Below i listed some of the best characters and pokemon natures that would benefit them the most and least. Finding the right pokemon nature for catch is going to be that competitive edge you need when you are doing any form of Pokemon Battling. This also applies to pokemon trading aswell. The more rare your pokemon’s nature is the better. From obtaining the best pokemon nature type it will have really high value. That’s not the only reason you should be trying to hatch or catch it. You need to keep in mind of IV rating, as this type stat is also important when considering a pokemon nature’s stregth. Sometimes and not often, you may find one that is high on both, in this case you actually got decently lucky. Generally in all games that featured pokemon natures, the fire type pokemon are the hardest hitters and finding a pokemon go nature that increases your damage would be absolutely dominating. There’s absolutely no point to capture a Vaporeon with a pokemon go nature of Bold (increased defense). It’s already very powerful in attack, because of that you should almost always focus your efforts into powering up the stats most beneficial to the pokemon and not against it. Simple strategies are often times the best. Check out the tier list for more information on how to be the best.